Neck Pain - Could it be a Facet? Have you ever gone to sleep feeling completely fine and then you wake up with a painful ‘crick’ in your neck? This is a common complaint amongst patients that come into the clinic each week. Sometimes extreme neck pain can be caused by a simple dayto day activity such as sleeping or twisting the neck. This results in painful loss of cervical range of motion, especially rotation and extension. It can also cause the muscles around the neck to tighten up, causing additional pain around the neck and shoulders. This pain could be due to irritation in one of the facet joints in the cervical spine. 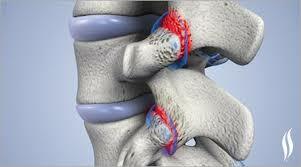 Facet joints are tiny joints on either side of the spinal vertebral except for the very top vertebra. These joints are what gives our backs flexibility and allows us to bend and twist while also protecting our back and neck by preventing excess movement. Each facet joint has a tiny piece of cartilage between it and a small fluid filled sack around it to help allow smooth and easy movement.Sometimes these joints can become inflamed which causes excess fluid to build up around the joint restricting the movement and causing a great deal of pain. If you are suffering from facet joint irritation or sprain the best thing to do is to put heat on the back of the neck to allow the muscles to relax, take anti-inflammatories*, and practice gentle neck range of motion. Additionally you can visit a Physiotherapist at ReBalance who may use dry needling, massage and gentle neck mobilisations to help increase your range of motion, reduce muscle tension and most importantly, reduce pain. If you think you are suffering from a facet joint problem or neck pain in general call our city centre clinic at 01 441-0100 to speak to a Physiotherapist.